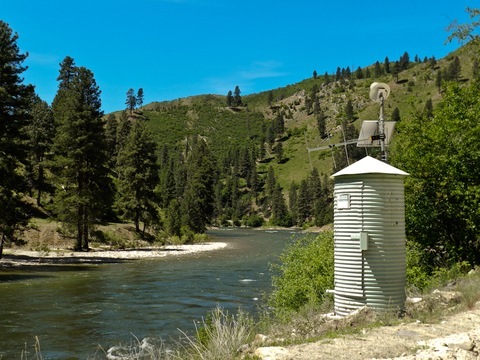 BOISE, Idaho — The government’s automatic budget cuts, known as sequestration, are taking down up to 150 of the nation’s stream gauges — devices that provide life-saving flood warnings and help scientists track drought conditions. The first round of nationwide closures started this month. These streamside outbuildings shelter data-gathering equipment so it can be fed to satellites. They track temperature, stream flows and pollution levels. Stream gauges aren’t getting the same sequester-cut attention as airport control towers or Head Start classrooms. But for scientists, it stings to see them swept away by spending reductions. “To lose a gauge would be like losing a member of the family, almost,” said John Clemens of the U.S. Geological Survey. 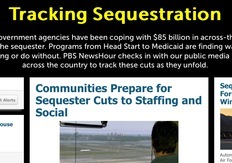 How sequestration affects communities across the country. The USGS managed to avoid shutting down stream gauges in Washington state, where Clemens works. His neighboring states of Idaho and Oregon weren’t so lucky. Each had to shut down three gauges due to the sequester’s $85 billion in across-the-board cuts. Scientists use stream gauges to determine how much water will be available for the hundreds of hydroelectric dams. The data helps drive decisions about when farmers should draw water from rivers to water their crops. The recreation industry uses stream-gauge information to decide when to fish and when to go rafting. Many of the stream gauges in the West are more than 100 years old; they’re known by the USGS as sentinel gauges. Even if the stream gauges being shut down are brought back online, the sequester cuts will results in gaps in data that had been continuously collected for decades. One of the gauges that has been shut down in Idaho is on Lapwai Creek. It’s one of the important streams for thousands of federally protected salmon in north Idaho. That gauge is located about 3/4 of a mile from where the Nez Perce Tribe just recently introduced 500,000 hatchery-raised salmon. Data from the stream gauge there helped the tribe determine when stream levels were sufficient to accommodate these juvenile fish. Aaron Penney is a fishery manager with the Nez Perce Tribe. He says the tribe’s fishery and its water resource managers used the information from the stream gauge on a regular basis. It collected data that helped determine if enough water was in the stream to provide for fish’s needs, as required by a federal court settlement that his tribe fought for. Lapwai Creek is home to two species of salmon, including the reintroduced coho salmon that had been listed as extinct by the federal government. The tribe has worked hard to get these salmon back. The stream is also diverted by the Lewiston Orchards Irrigation District which uses the water for crops. Keeping enough cool water flowing in the stream keeps fish alive. If the water gets too warm, it kills the fish. Michael Lewis is head of the USGS in Idaho. He spent the last few weeks trying to determine which water gauges would have the least impact on the state if they had to be shut down. Lewis says that was a nearly impossible task, since the gauges work together as a system. This story first appeared on Idaho Public TV’s EarthFix website on May 3, 2013, as a collaboration with EarthFix. EarthFix is a public media project of Oregon Public Broadcasting, Boise State Public Radio, Idaho Public Television, KCTS 9 Seattle, KUOW Puget Sound Public Radio, Northwest Public Radio and Television, Southern Oregon Public Television and the Corporation for Public Broadcasting.